The Wall Street Journal hails New York-based flute duo Flutronix as “a unique blend of classical music, hip-hop, electronic programming and soulful vocals reminiscent of neo-R&B stars like Erykah Badu.” For this LiveConnections concert, Flutronix will mix it up with Philadelphia artist Ryan Matthews, merging Flutronix’s unique flute sound with Matthews’ trombone-meets-electronica. Catch the energy and innovation in the dynamic Upstairs Live venue at World Cafe Live, Philadelphia, while enjoying dinner and drinks. Doors open at 6:30pm for dinner; the show starts at 7:30pm. 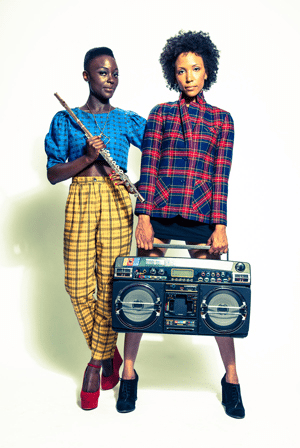 Flutronix is Nathalie Joachim and Allison Loggins-Hull, two blazing young flutists who are “redefining the flute and modernizing its sound by hauling it squarely into the world of popular music” (MTV Iggy). Their original urban art pop is best described as “a unique blend of classical music, hip-hop, electronic programming and soulful vocals reminiscent of neo-R&B stars like Erykah Badu” (The Wall Street Journal). Their work as performers, producers and composers has moved them to collaborate with artists and ensembles from different realms and disciplines, including electronic music sensation Dan Deacon, legendary hip-hop producer Ski Beatz, the International Contemporary Ensemble and more. 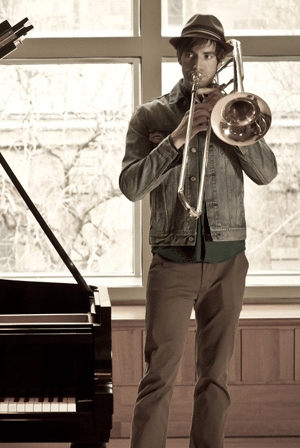 Ryan Matthews received his bachelor’s degree in trombone performance from the Curtis Institute of Music in Philadelphia where he studied with Nitzan Haroz. He has participated in the Spoleto Festival and Music Academy of the West and participated as finalist in the Frank Smith trombone competition as part of the International Trombone Festival. In 2009, he was a recitalist and faculty member of the Asia Trombone Seminar in Taipei, Taiwan, and soon afterward, toured the U.S. with the Curtis on Tour ensemble. Ryan also has extensive orchestral experience, having performed with the Colorado Symphony, the Opera Company of Philadelphia, the Philadelphia Chamber Orchestra, Symphony in C, and the Curtis Symphony Orchestra. Ryan has a great passion for teaching, and works as a teaching artist in the Philadelphia area for the Philadelphia Orchestra, the Salvation Army and LiveConnections, among others, introducing classical music to kids from grades K-8. In addition, Ryan is an award-winning composer/prod ucer and is releasing his first full-length electronic music album with overseas label/distributor Phrench Records.